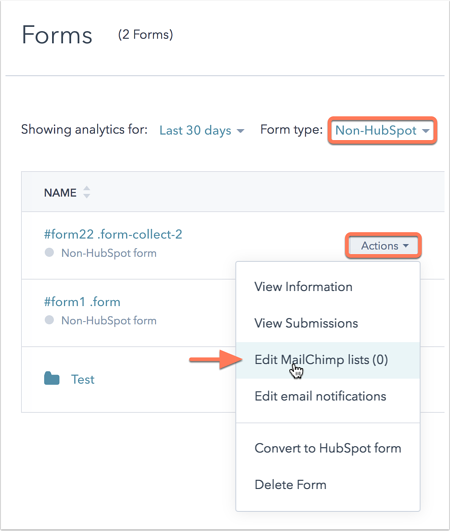 After you connect your pop-up forms and non-HubSpot forms to your MailChimp account, you can add contacts who submit to those forms to specific MailChimp lists. Please note: if you're using Zapier to integrate HubSpot with MailChimp, refer to Zapier's documentation on the integration. HubSpot will not retroactively push contacts who submitted your pop-up form or non-HubSpot form before you connected your MailChimp account and set up the form. HubSpot will not be able to sync with a MailChimp list that has required merge tags for which HubSpot doesn't send a value. It's recommended to sync your form with another MailChimp list, or remove the required merge tags. HubSpot is only able to trigger auto-response emails using MailChimp's automation feature. In the left sidebar menu, navigate to Marketing > Email service provider. In the dialog box, select MailChimp. You'll be redirected to a login screen. Enter your MailChimp login credentials, then click Log In. 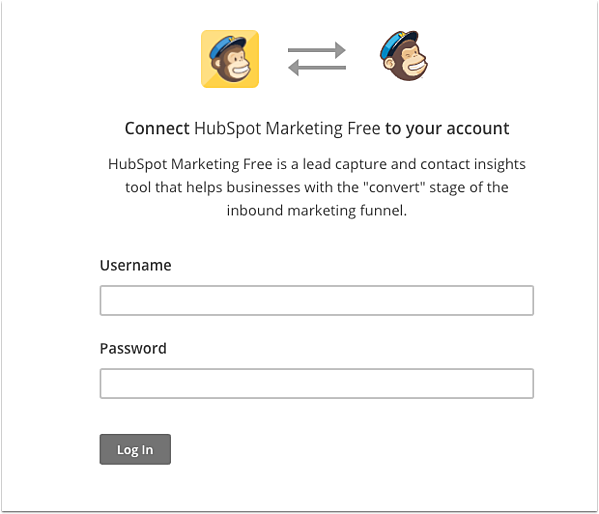 Next, set up your pop-up forms and non-HubSpot forms to push contacts to MailChimp. In the upper left, click the Form type dropdown menu and select Pop-up. Click the name of the pop-up form you want to push to MailChimp. In the pop-up form editor, click the Options tab. In the Push new contacts to your email provider (optional) section, click Select lists. In the dialog box, select the MailChimp list(s) to add contacts who submit this form to, then click Save. In the upper left, click the Form type dropdown menu and select Non-HubSpot. Hover over the non-HubSpot form you want to push to MailChimp, then click the Actions dropdown menu and select Edit MailChimp lists. In the dialog box, select the MailChimp list(s) to push contacts to, then click Save.